Paper is confusing. There are different types, weights (thicknesses), and sizes. The chart below details the equivalent weights (in pounds) between paper types, as well as notes in the left margin to show when certain types of paper are most appropriate. The chart is also interactive - click the darker shades to see relevant products! - "Caliper" refers to the thickness of a paper in thousandths of an inch. To be approved to ship via USPS, your paper must be at least 3.5 inches high x 5 inches long x 0.007 inches thick. 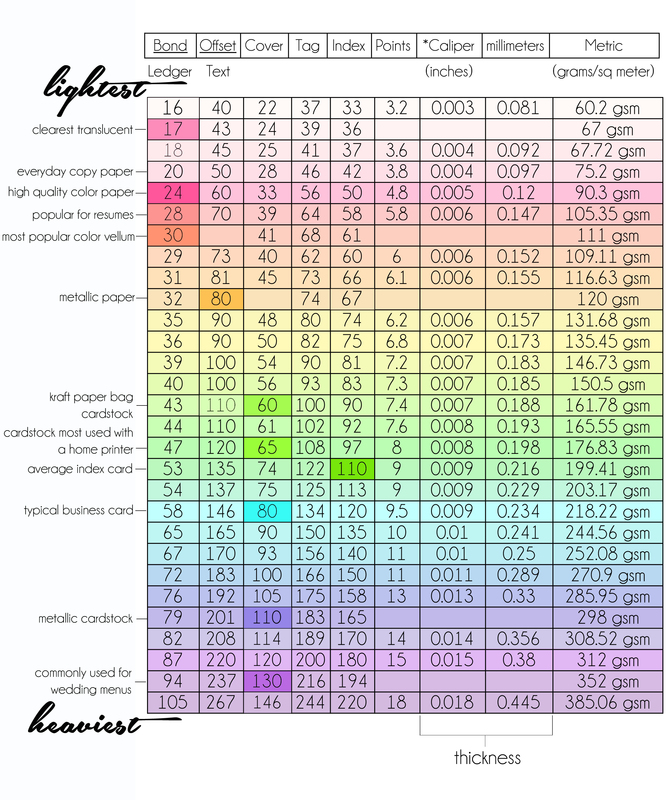 Your paper cannot be more than 4.25 inches high x 6 inches long x 0.016 inches thick. - Additional postage will be required for paper that does not meet these requirements. Visit the USPS website for additional information. Subscribe for more information like this and exclusive coupons! Subscribe for more useful information! Subscribe for more information!